Roy Berg, Irvin Strand, Delmar Gusdal, Ronald Anderson, Lawrence Wetteland. Front Row: Julian Kowalik, Shirley Wetteland, Norma Gusdal, Evelyn Gusdal and Orville Berg. What a busy place that schoolyard has been! When the melting snow in spring would bare grassy patches here and there, the children sat on blocks of wood and played knife. Other between season games were Prisoner's Base, Pump, Pump Pull Away, Three Deep, the inevitable tag as well as musical circle games. Somehow that yard has shrunk now. The barn which seemed so far from the school, wherein Toby and Frank, Bluss (Blaze - there had to be one horse who understood Norwegian) and little grey Fred munched hay and waited for four o'clock, is now just a small building tucked into one corner of the yard. 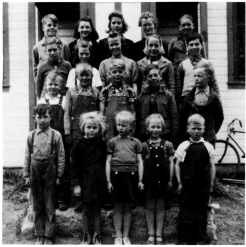 At one time or another practically every family in the district had members take their turn as school trustees. Therefore this long list is not included in this story. Hopefully they appear in the family histories. However, we salute these willing people and thank them for their efforts for the good of the school. After over seventy years in operation, Tales School along with numerous others was at last overtaken by progress and new educational systems. It is now just part of the treasury of childhood memories. A living monument --------- a youth! Pupils of Tales School prior to 1900. Teachers of Tales School- 1893-1963. The Hilltop School District No. 801 was organized in 1894. The first chairman was Peter Walstrom and the first Secretary Treasurer was Andrew Edwardson.